Ok, someone please explain this one to us because we must be a little slow. Wasn’t the whole thing with the debt ceiling hike such that no more Congressional melodramas would have to be inflicted upon the population until after Obama [won|lost] the 2012 elections? Because according to the one again exponentially increasing debt balance of the US Treasury (there is another $51 billion in debt/cash coming in next week), the total US treasury balance (subject to the ceiling) is $14.54 trillion (and $14.58 trillion for total), an increase of $20 billion overnight, the Treasury will hit its latest ceiling no later than the end of September. 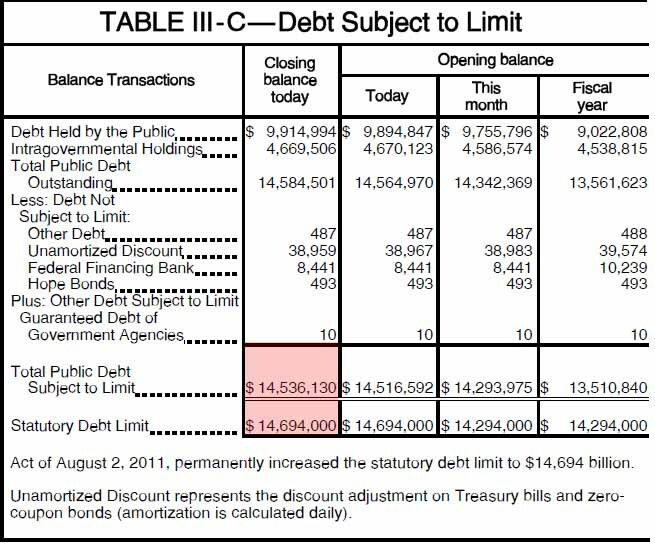 As the latest DTS statement indicates, the debt ceiling now is $14.694 trillion: a number which Tim Geithner will hit in about a month. So if this is due to a planned expansion as part of the two step plan, we would like to understand how it works, because the $400 billion additional ceiling is barely sufficient to cover the catch up in funding for the SSN and the various governmental trust funds. And the far bigger concern is that tax receipts are about to plunge courtesy of the imminent double dip. So we wonder just based on what assumptions does the Treasury believe that its issuance needs will be met by this paltry debt ceiling. Monday, the global markets fell sharply as people around the world started pulling their money out. In the USA, 620+ on the Dow, all sales, no purchases. Volume, usually around 750 million a day during August, exceeded 2 billion. Tuesday, the FED intervened and started buying US treasuries. Although the markets around the world were reviving, fears about France began to concern investors. Wednesday, the world markets tumbled again as the crisis continues to spread. Over 2 billion shares traded on the DOW yesterday, all were sales. This is the beginning of a run on the banks. Today, the FED is at it again, buying more and running up the debt as you describe, but the world markets are imploding, and the FED cannot put it’s band aid on the entire world. We are no longer the world’s largest economy, we have been gutted by the banks and wall street. The entire global economy is in meltdown. Undoubtedly, the Chinese and other countries have recently discovered that Italy and Greece, with smaller debt to income ratios than the United States, are less riskier and carry a higher rate of return. This is because, unlike the US, the Rothschild/Rockefeller bond rating agencies have trashed their country’s debt ratings, forcing them to pay a much higher interest rate than U.S. Treasuries. Hey, if you take the risk, you might as well earn the reward!